The importance of double end bag workouts are often overlooked by amateur boxers, even though the routine is vital toward finding success in ring fights or even practice sparring matches. The double end bag (sometimes called the crazy bag or reflex bag) is a variant of the speed bag. It is inflated with air like a soccer ball and attached to the floor and ceiling with what are essentially bungee cords. Double end bag cords are specialized for the specific function and not quite the same as the bungee cords you use to hold down cargo in your truck. The double end bag works by swaying quickly and somewhat randomly each time you hit it, so your next punch relies on your reaction time, quickness, and finesse with your hands rather than trying to throw power punches. Like any other exercise, working out with a double end bag requires proper form and training. You need to learn how to punch the bag and become familiar with hitting it without hurting yourself before you can advance to more complicated workout routines utilizing the bag. Wear Proper Gloves – Proper gloves are either 14oz or less boxing gloves commonly called “bag gloves” because they are great for practice or sparring but not legal for actual in-ring fighting. Alternatively, MMA style gloves are appropriate. An experienced fighter who wants a quick workout at home might get away with taped fists, but it really isn’t recommended because tape doesn’t provide the level of protection for your hands that gloves do. Ball Position – The ball should be positioned at shoulder height. Although it resembles a speed bag, the double end bag provides different workouts and develops different skills. Cord Tightness – Start with a tighter cord to learn how to hit the bag and react to the lesser but faster movement it has under tension. It is generally easier to hit at higher tension because the movements are fairly predictable. Once you become comfortable with your ability to hit the bag repeatedly, loosen the cords to provide more unpredictable movements which require you to react as you would when boxing an actual person. Start Small & Quick – When learning the double end bag, use short small punches, learn to control your combinations, and develop a rhythm. Remember, the double end bag is intended to develop speed and accuracy, not power punches. Power punch workouts are also important, but useless in the ring if you don’t have the grace and finesse to actually land them. Best Punches – Although you aren’t working with power punches, it is important to train with all the punches in your arsenal to learn how to build efficient combinations which will baffle your opponents. The jab, cross, hook, and uppercut are standard baseline punches to develop in alternate combinations so you’ll be ready to use them in the ring however the situation calls for. 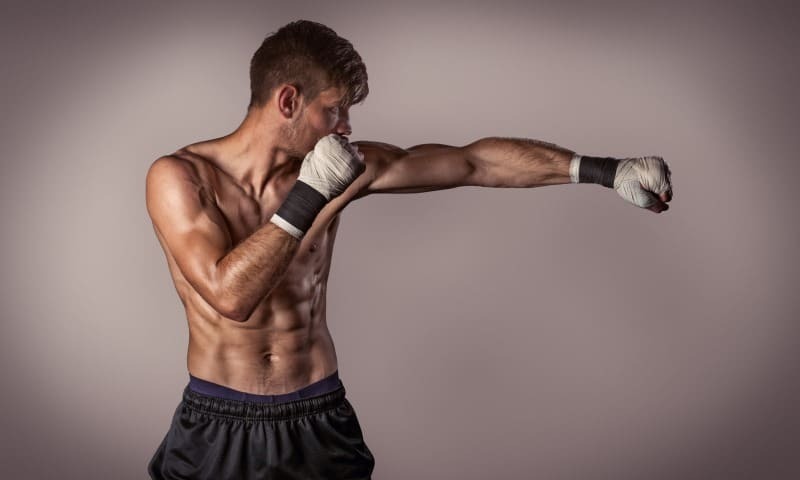 Simply practicing your punches against the bag and using footwork to prepare your next shot is an exercise in and of itself, but there are more specific workout routines available which will better prepare you for sparring or formal competitive boxing. Specific double end bag workouts will increase your skills and make you a better fighter. The simplest rhythm is the basic 1-2 jab/ cross. It’s probably the first combination you learned when you started boxing and is a great way to learn how to use a double end bag. Once you learn how to control the bag and use your footwork to set up the next punch, you can start doing more intricate combinations as part of your workout routine. 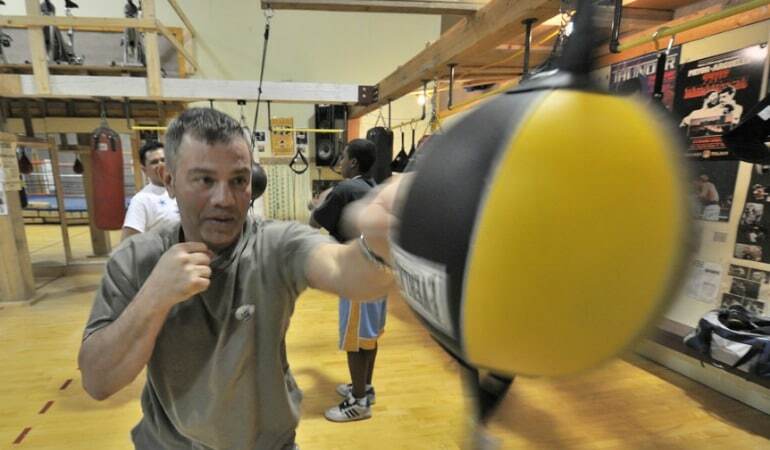 The bag will naturally instill a sense of rhythm to your punches as you learn how to react to its movements. Once you’ve loosened the tension and allow the bag to have full movement after each of your punches, it can potentially hit you in the face. Just like you might do with a standing opponent who has longer reach than you do, stand close and hit when you can while maintaining a defensive posture to assure the bag doesn’t swing back and hit you instead. Similar to defensive combinations is a footwork routine. The idea is the same, you don’t want to get hit in the face by a bag swinging wildly between two bungee cords, but instead of standing close and using defensive postures to keep from getting hit you use footwork to get out of the way and align your next shot. Just like you do on the heavy bag, try to work with different combinations of punches to see what feels right and works naturally for you. You’ll find different combinations work better on the double end bag than some of the combinations you’ve become accustomed to on the heavy bag. This will relate to your in-ring experience because you’ll see the difference between punching a fresh and active opponent with quickness and grace versus throwing power punches to finish off an opponent who is gassed. Bounce and box is a workout routine that is exactly what it sounds like. You conduct exaggerated head bobbing and footwork like shadowboxing, or that you might see from an idiot actor who has never boxed do in a movie. You might feel silly, but that doesn’t negate the fact that it’s a great workout routine that will help you feel more comfortable when you need to move your head in a real fight. Punch the bag and hold your face in the area it swings, and get your head out of the way each time it comes toward you. The intended use of a double ended bag is to work on hand speed, footwork, and timing. Because the bag is attached by bungee cords at each end, it can be confusing how to use it correctly. Here are some tips to get the most out of a double end bag. Punching Speed – Although the double end bag works a little differently than the speed bag, it can perform the same function. Simply tighten the cords and keep punching it each time it returns from the last punch. Punching Power – The double end bag isn’t really the best way to practice power punches, but you can incorporate a few power punches into your routine with the bag. Doing so will help you understand when and how to incorporate your power punch in an actual fight in the ring or with a sparring partner. Punching Accuracy – When you view the bag casually, it seems fairly large and certainly a size you can’t miss with a standard punch. Once you start getting tired and are watching it move around randomly each time you hit it, it gets a little harder. The process will acclimate you to the idea of hitting a moving target after you’re tired, and maintaining proper form throughout a fight even when it means ignoring how tired you really are. Rhythm & Timing – The biggest key to getting a great workout from a double end bag is to focus on rhythm and timing, as that is what is needed to continue to hit the bag each time it swings toward you. Reflexes – Once the cords have been loosened, the bag will jump around in ways you never would have expected. You will build quick reflexes as you learn how to react rather than anticipate the bag’s movements, and this will carry over to when you are in a ring fight or trying to overcome a sparring partner. Endurance – Any workout is good for endurance, but some are designed more toward muscle growth and other are cardiovascular in nature. The double end bag requires fast footwork and rapid repetitive hand motions, so it builds muscle and promotes endurance. Improve Footwork – Your footwork is guaranteed to improve simply because the double end bag swings back at you, it has what is essentially a counter attack built into its very design and function. You can move your head and block with your arms, but eventually you have to use footwork for defense and to set up your next punch. Any time in the gym is good for your boxing routine. Whether you lift free weights, run on a treadmill, or smile at attractive people while using the workout machines, you’re going to get something out of the time you spend in a gym and it will help your performance in the boxing ring. The general idea with the double end bag is to balance your workouts in such a way as to create a skill set which is versatile and allows you to change your style as needed for any opponent you may box whether sparring on the mat or competing with in the ring.